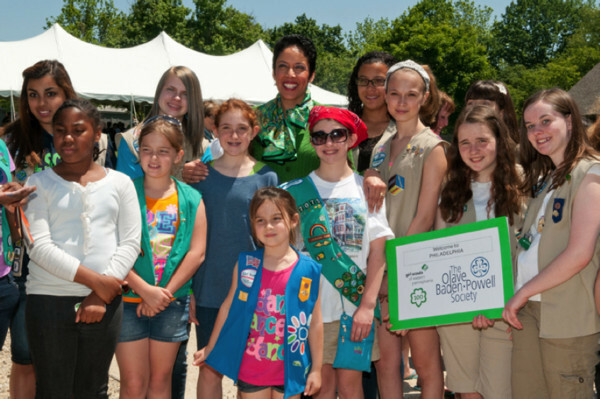 In Pennsylvania, the Plymouth-Whitemarsh Patch reports that the CEO of the Girl Scouts of the USA, Anna Maria Chávez, welcomed the Olave Baden-Powell Society to the Philadelphia area for its annual World Conference from May 16-20. This was the first time the OB-PS has held its annual meeting in the United States in 15 years. The Girl Scouts of Eastern Pennsylvania's Shelly Ridge campsite in Miquon played host to both national scouting leadership and foreign dignitaries on May 19th, as part of a World Conference of the Olave Baden-Powell Society. The Olave Baden-Powell Society is an international organization dedicated to female leadership, and decided to host its annual four day conference in Philadelphia to help the Girl Scouts of the USA celebrate their 100th anniversary. Olave Baden-Powell Society was welcomed to Philadelphia by Mayor Michael Nutter, who presented its leadership with a Philadelphia Bowl Award at a reception the the National Constitution Center. On Saturday, members of the Olave Baden-Powell Society, GSUSA, and Girl Scouts of Eastern Pennsylvania's gathered at the Shelly Ridge campsite for an afternoon of workshops and a tree-planting event. Anna Maria Chávez, CEO of the Girls Scouts of the USA; HRH Princess Benedikte of Denmark, patron of the Olave Baden-Powell Society; and Girl Scouts of Eastern Pennsylvania's President Natalye Paquin all participated in the planting. Girl Scouts of Eastern Pennsylvania's serves 41,000 girls in partnership with 15,000 volunteers in Berks, Bucks, Carbon, Chester, Delaware, Lehigh, Montgomery, Northampton and Philadelphia counties.